How to install GIMP for portable usage? For Windows computers GIMP is available as a Portable APP but only for a stable version. Insofar as this is my preferred method of installation/usage I'd like to make my own portable installation on an external disk drive for a newer/development version. I've been able to run the installer and choose a target location on the external drive. This has the affect of locating the program files where I want them. Unfortunately, when GIMP executes it creates a bunch of folders for persistent data on the path "C:\Users\username\AppData\Roaming\GIMP\2.9" which is most undesirable. Insofar as the Portable Apps folks are able to change this I thought I should also be able to do that as well. The question is how? The Windows port of Gimp is very moveable, In the past I have copied the Gimp folder onto a computer (faster than the installer) but it does make a Gimp profile, which you do not want. That might help you out with your 32 bit question, it comes with separate 32/64 bit versions. Edit: Just tried this latest version and you might have to use the 32 bit package. 64 bit does not load any icons. 32 bit seems to work ok, bound to be some bugs somewhere. I see it has been updated. "Volume de l'archive du 27 février 2018" This is a screenshot, using the previous version. The Gimp profile is the Preferences directory. Try it from an external drive. Edit No.2 I see Partha does have a Portable Gimp 2.9.8/9 http://www.partha.com - have you tried that one. The one from Partha was pretty easy to unpack (i.e., unzip) and run. It seems to work but only minimal use so far. A few observations based on this limited experience. The size is 500MB where as the version I'd been running (i.e., conventional 2.9.8) is 340MB. The files located on the C: drive, that I'm trying to get rid of, represent a mere half of a MB. Why the difference? I did notice that there is a folder named "frameworks" in Partha's distribution which doesn't exist in any of the others I've used which consumes 180MB of storage. Any idea what "frameworks" is about? Also, per this post I tried to include the help files but I can't even get access from the Menu>Help much less context sensitive help. I also observe that the directory structure deviates a bit more than the mere presence of the "frameworks" folder mentioned above. The path to the folder named "share" differs a bit from other installations but I went ahead and placed the help folder as a sub-folder of .../share/gimp/2.0. You could look at the portableapps 2.8 installation and how it utilises the Gimp environmental variables to point to the installation. Some (old-ish) information here: https://www.gimp.org/man/gimp.html down the page. If the object of the exercise is purely an installation on a drive other than C: Why is the 0.5 MB gimp profile in roaming such a problem? 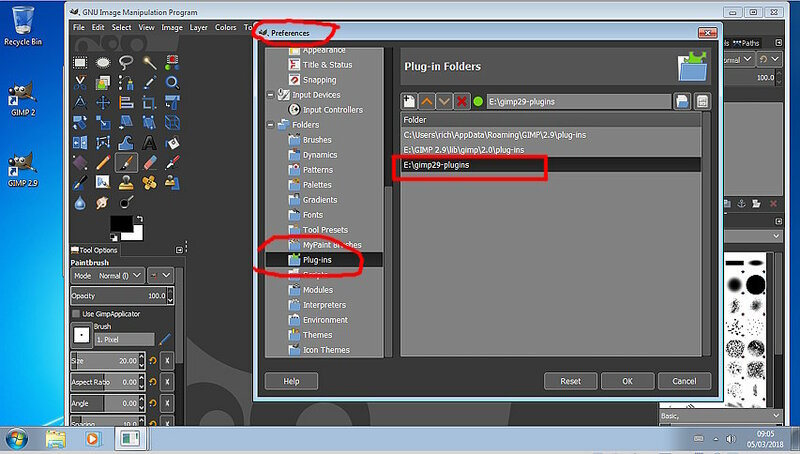 Make new folders on the E: drive for any resources you need and add in Gimp 2.9 preferences. There is on-line help: https://docs.gimp.org/2.9/en/ but that is very much work in progress. As in the 2.8 splash screen still there. I did look at the GIMPportable.ini file which gave me an idea. It looks like portable GIMP is installed using a directory structure that deviates from the standard one and as a result lots of things have to be redefined. In my case, the directory structure is the same as with a standard installation. 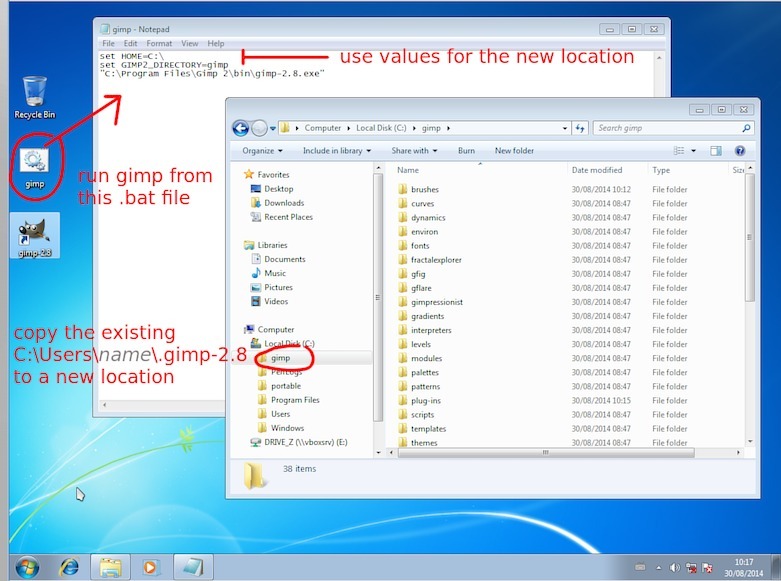 Therefore, I wrote a script for invoking GIMP that changed the standard Windows environment variables %LOCALAPPDATA% (as well as %APPDATA% for that matter) to reference a folder that I created near to the standard GIMP structure on my external drive. However, this didn't work. Makes it looks like GIMP hard-codes these values rather than using the variables supplied by Windows. I can't think of a good reason for doing that but it would seem like a simple way to solve this problem if GIMP were to use these environment variables for there intended purpose. Another plausible explanation is that my novice script writing ability hasn't yet figured out how to change them in way they are still in effect when GIMP is invoked. I will look at the GIMPPortable.ini a little closer to see if I failed to recognize how it works. Installed Gimp 2.9 to E: (as previous post). Run Gimp to get the gimp profile C:\Users\name\appdata\roaming\GIMP Moved that to E:\ and renamed to profile. Keep it simple to start with, no spaces in file names, no over long file paths. That works here, Gimp will use the new profile location, Profile settings are retained, creates and saves/exports an image. 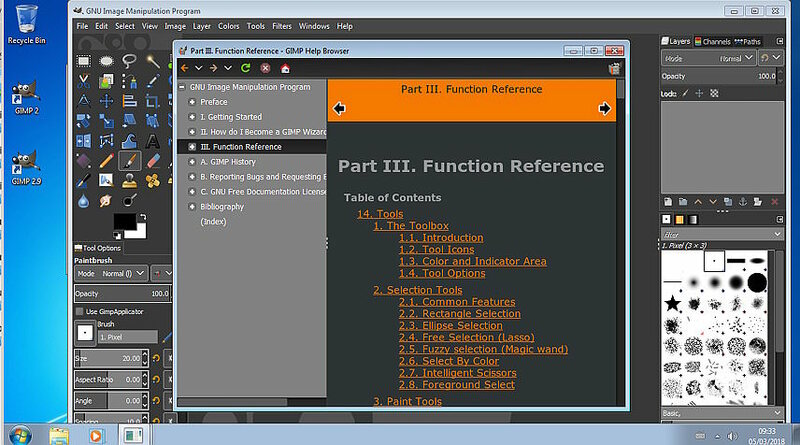 All in one screenshot: Gimp 2.9 started from batch file. https://i.imgur.com/Wz1m5Ey.jpg and you can see in Edit -> Preferences the location for profile folders is set. I still think, not a great idea, bound to be snags. Great! This looks promising for me also. GIMP starts and it appears that nothing is added to system drive (i.e., C:\users). 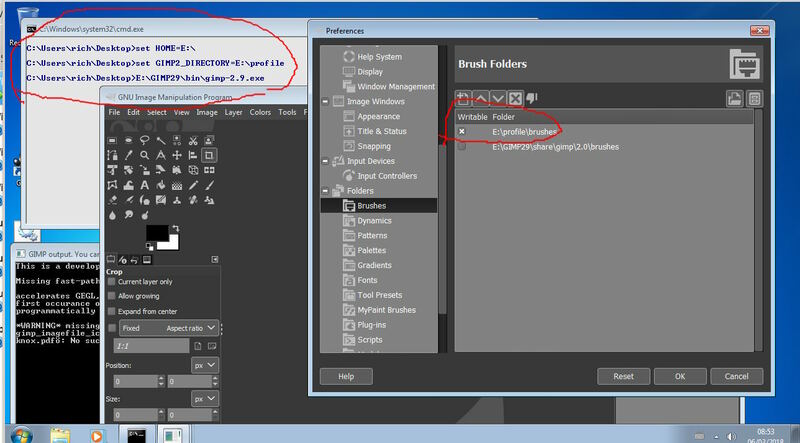 However, there are a few things that look suspicious such as errors displayed on the console that this version of GIMP keeps open as well as some missing folders based on comparison with the default startup. I need to do more analysis before commenting further but would appreciate learning more about these GIMP variables. Did I fail to find this information in the normal GIMP documentation sources or is this something known by those who interact with developers? It looks like fairly straightforward deduction to figure out the meaning/usage of GIMP_DIRECTORY but I can't say the same about HOME. Some elaboration might be helpful. (03-07-2018, 05:48 PM)ajax Wrote: Great! This looks promising for me also. GIMP starts and it appears that nothing is added to system drive (i.e., C:\users). However, there are a few things that look suspicious such as errors displayed on the console that this version of GIMP keeps open as well as some missing folders based on comparison with the default startup. I need to do more analysis before commenting further but would appreciate learning more about these GIMP variables. Did I fail to find this information in the normal GIMP documentation sources or is this something known by those who interact with developers? It looks like fairly straightforward deduction to figure out the meaning/usage of GIMP_DIRECTORY but I can't say the same about HOME. Some elaboration might be helpful. On Linux man gimp tells everything. I don't know where the same info is hidden in Windows. Attached the output below. I have already reverted the Win7 VM back to basic, so not able to do any testing at the moment. So far it is not clear whether or not I have a problem. My results differ from yours slightly and I thought your opinion about my status is better than mine. To start I know enough about Linux to know what $HOME means in that case. I don’t see an analogy in Windows. Here is a link to a set of screenshots. They represent doing the same thing in both standard/normal mode and what we’re trying to achieve here which I’ll call portable. Insofar as Linux goes, I don’t think there is any way to do what we’re talking about in that environment. I don’t think Linux is even able to execute anything stored on media formatted with a Windows based file system (like you find on all jump drives). There is no such thing as "execute" permission on such file systems. If I simply start GIMP both normally and the way we’ve discussed herein the console display contains only one line that is different. To see it you only need to look at this screenshot for the startup in portable mode. Line 13 (not counting blank lines) where it says “Failed to parse tag cache: No such file or directory” is the only difference. Given the number of other errors displayed on this screen that is not too alarming. However the bigger discrepancy between the 2 modes of starting GIMP has to do with the folders that get created. 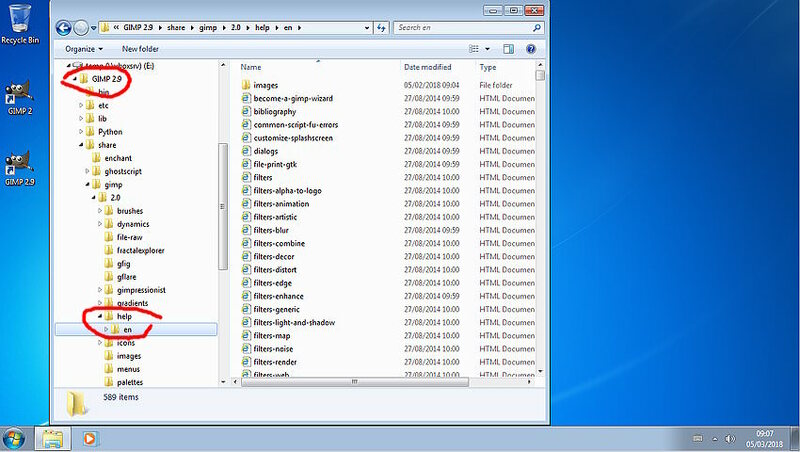 Here is a screenshot which shows what results in the way of new files/folders being created on the system (i.e., C drive. 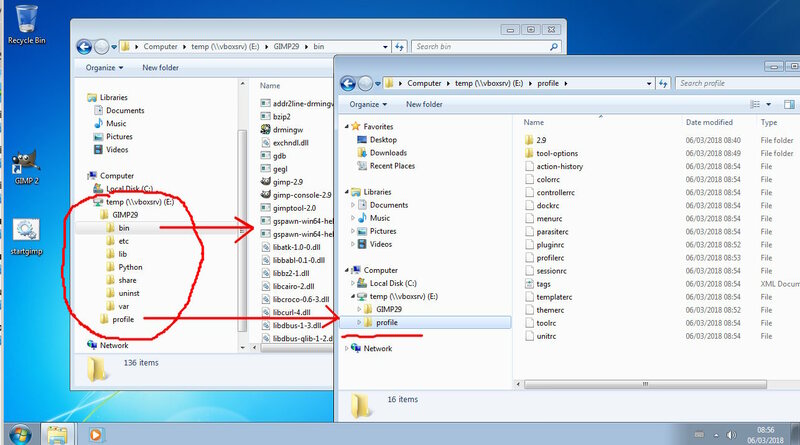 While I cannot compare this directly with the screenshot you made it does show a folder named “2.9” within the top level GIMP folder as does yours. 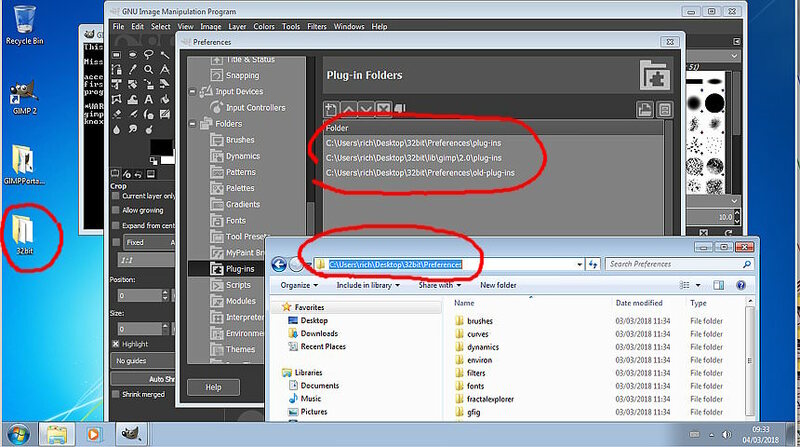 However, this screenshot shows what gets created when I tried my portable startup with “GIMP2_DIRECTORY” referencing my folder named “\MyWin\GIMP\W64\UserData\GIMP”. Notably absent is the sub-folder named “2.9”. When I view the menu item Preferences>Folders what look like the corresponding sub-folders under “2.9” point to precisely where they should. There are just no folders defined at that location. All it took in the case of normal operation was to complete startup for such folders to be newly created. In that, my experiment made sure those folders were absent when running the normal startup. Insofar as those folders are all empty after completing the normal startup this may not be a problem as long as they can be written to when needed. Any ideas?